Catoboost Vit. 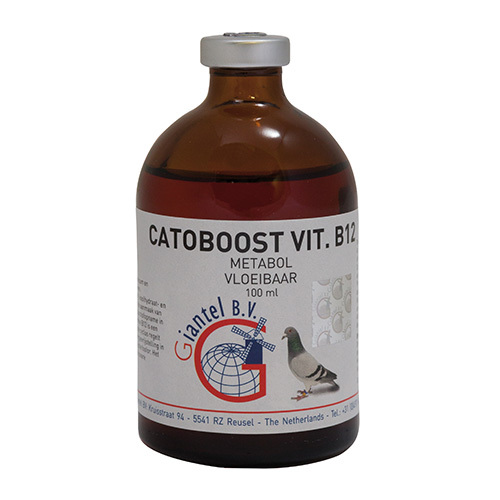 B12 by Giantel is used in racing pigeons to improve muscle strength and general condition. Vitamin B12 will boost the protein-, carbohydrate- and fat metabolism. It stimulates the production of red blood cells, resulting in an increased oxygen intake in the bloodstream. Vitamin B12 plays an important role in the Krebs cycle. This cycle regulates the cellular energy metabolism. Butafosfan is an organic phosphorus. It ensures faster recovery after heavy races. For oral use via drinking water. General dose: 4 ml per 2 litre of drinking water. Curative treatment: administer during 5 – 7 consecutive days. Preventive treatment: administer during 2 consecutive days. Medicated water should be refreshed daily.